Competitive carbonless A4 3 part duplicate order form printing, full colour 3 part ncr carbonless forms printed at trade print prices and dispatched on a next day courier service to Ireland. Competitive carbonless duplicate order form printers of 3 sheet A4 ncr carbonless invoices and business forms, printed at very competitive printing prices. Competitive printers delivering A4 duplicate NCR order pads and invoices to Ireland. 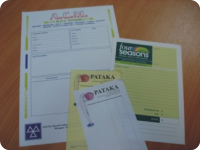 Full colour one sided carbonless forms, printed onto 3 part carbonless ncr sets..
Full colour two sided carbonless forms, printed onto 3 part carbonless ncr sets..
Free A4 3 part ncr carbonless forms artwork checks or use our low-cost design and artwork service. We offer a competitive nationwide carbonless 3 sheet NCR printing service to and the rest of the United Kingdom.